It’s March in Michigan, a time when gray skies & vitamin D deficiency induce a mild psychosis, the moral compass fails and you struggle with basic questions like: Should I go running or take a nap? Should I make dinner or create a new Pinterest board? P90X or finish off that pint of Chubby Hubby? In July, when the days are long and the sun is shining…it all seems so black and white. Right now, it’s just gray… “I’ll regret both Chubby Hubby and P90X tomorrow morning, so why pick the one I’ll regret NOW? !” Well, clearly the Ben & Jerry’s pint has been winning lately, so it’s no surprise the kids asked for a safe version of my all-time favorite flavor. For you poor souls who haven’t fallen off the bandwagon, Chubby Hubby is a heavenly blend of vanilla ice cream chock full of chocolate-covered peanut butter-filled pretzels. I swear they space the pretzel chunks out just enough so you find one…just as you’re promising to stop eating…and then of course, you have to dig it out. Sweet, salty, crunchy, chocolate. Sigh. Amazingly, the kids’ version is pretty doggone close in flavor. Shocking, actually. I let the kids build the “faux-filled” pretzels. 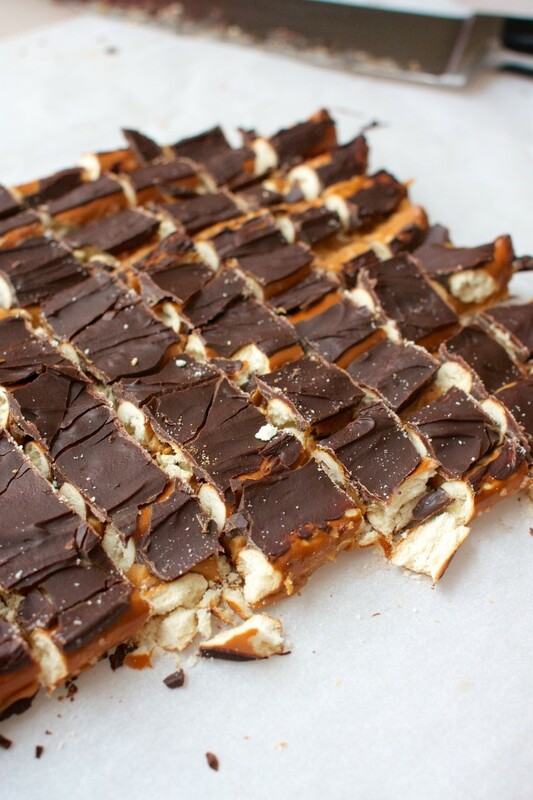 Basically, you cover a row of prezels with soy butter (or sunflower), freeze them and then pour melted chocolate overtop. I always make extra pretzels with the intention of freezing and using for another batch of ice cream…but the kids find that ziplock in the freezer and devour the extras! Line the pretzel rods up on a small parchment-lined baking sheet. Spread the soy butter overtop, and squish inbetween the pretzels. Pour 1/2 the melted chocolate overtop of the whole frozen pretzel block. Return to freezer until chocolate hardens, then flip the block over and pour the rest of the chocolate over the other side of the pretzel block. Freeze again and then chop into pieces for the ice cream. Heat for 1-2 minutes, until soft and puffy. Whisk the soft marshmallows with 1/2 cup soy creamer until smooth. You may have to return the mixture to the microwave for another minute or so to get the marshmallows to fully melt into the creamer. Add the remaining 2 1/2 cups of creamer, sugar and oil. Whisk until smooth and the marshmallows are all melted. Cool the mixture down in the freezer or refrigerator before pouring into an ice cream maker to freeze. I have a Cuisinart that is wonderful. 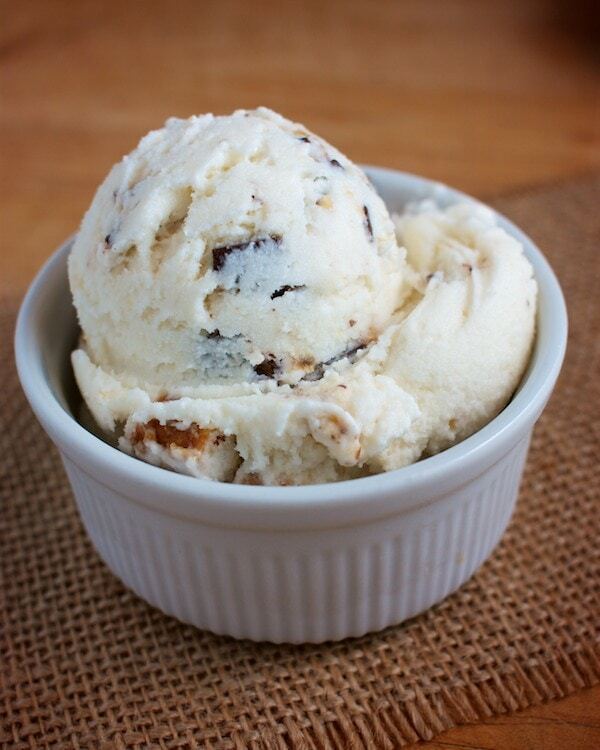 Scoop the frozen ice cream out of the ice cream maker into the container you plan to freeze it in. Stir in 1 to 1 1/2 cups of chopped pretzel mixture into the ice cream. YUM! This looks great, and I’m hoping it will be what it takes to convince my husband an ice cream maker is worth the space in our tiny city kitchen! Can’t wait to try it. You’re killing me here! That looks amazing. 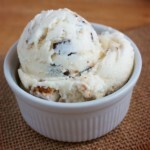 I got the same ice cream maker last summer to try out a “safe” ice cream cookbook. I loved both the ice cream and the machine, but yours sounds just perfect. Can’t wait to try it. Alright, this is the year! I have been eyeing your ice cream concoctions since your “once in a Blue Moon” post in 2009. It’s the base that intrigues me. I’ve never seen anyone else use a marshmallow base. My mother sent me an old used ice cream maker last year, so no more excuses, This year I’m doing it! BTW, I was just reading your other comments, and I think YOU should make a “safe” ice cream cookbook. Every one of your ice cream posts looks incredible!!! Thank you so much…aaaargh I don’t know which one to try first! Let me know how your ice cream turns out. Funny that you should mention the idea of an ice cream cookbook…I’ve been tossing the idea around myself…in my spare time! LOL! Thank you Meg for all of the delicious recipes! My 11 year old daughter is allergic to milk, eggs, peanuts, and tree nuts. It breaks my heart in the summer when everyone is running around with fun ice cream flavors and she is stuck with the same old thing. My older daughter suffers from Eosinophil Esophagitis and cannot have soy so we used Coconut milk creamer instead of soy creamer and it turned out wonderful! We can’t wait to try this recipe. We made cookies and cream flavored ice cream last night. Thank you for keeping the fun in food for all of our allergic children!!!!!! 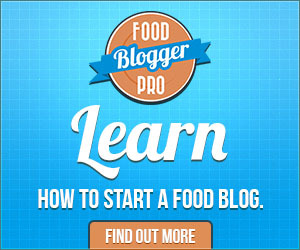 LOVE THE IDEA OF YOU DOING AN ICE CREAM COOKBOOK!!!!! Welcome to Speedbump Kitchen. Everything here is dairy, egg and nut-free. We're not vegan or much about health food. Sugar, chocolate, & bacon are on tap. This is fun food for the coolest allergic kids out there. In my spare time I'm a pediatrician and expert level Airstreamer.